Have you ever wondered what it would sound like if Sweetums from The Muppet Show started a Conan themed heavy metal band with Jello Biafra? No? Neither has anyone else. But that’s exactly what HYBORIAN STEEL sounds like. Unfortunately, as ridiculous as that description may sound, Blood, Steel and Glory fails to reach that lofty summit of so-bad-it’s-goodness. There are brief hints of unintentional comedic genius here, but nothing to equal something like DREAM QUEST’S masterpiece “Facekicker“. The problem, I think, is that the members of HYBORIAN STEEL aren’t bad musicians. The band isn’t redefining power metal as we know it, but some of these songs are catchy. The first three songs on the album – “Metal Barbarians“, “Blood, Steel and Glory” and “Aquilonian Battle Cry” – are galloping, up-tempo shredders. And the rest of Blood, Steel and Glory is fairly listenable as well. These guys aren’t IRON MAIDEN, but they can play competently. And you could find worse things to mine for lyrical content than Robert E. Howard’s Conan mythology. But, oh the “singing”. According to the band’s Facebook page, bassist Howie Roberts (extra points for the geektastic stage name) handles all the vocal duties, which means he’s solely responsible for the aforementioned Muppet monster vocals AND the lethargic, off-key Jello Biafra vocals. I’m not sure what the point of the dueling styles is, but it’s jarring to say the least. Roberts’ voice is like a loud, particularly rancid smelling fart. Yeah, it’s funny at first, but dealing with it for an extended amount of time gets uncomfortable. 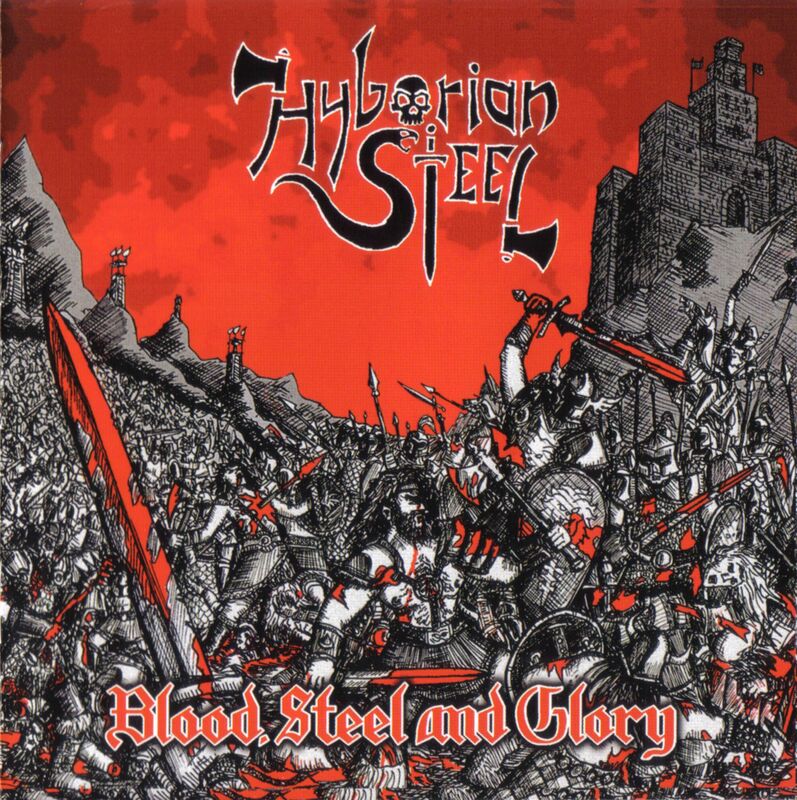 HYBORIAN STEEL have created something that occupies a weird grey area as far as mediocre albums go. The ridiculous vocals keep Blood, Steel and Glory from being an enjoyable, if not predictable, power metal album. But the adequate musicianship of the band members prevent the album from being a hilarious wreck. Still, the more I listen to the album, the more enticing I find it. It’s hypnotic in it’s obnoxiousness. Crom help me. Previous Post: Insane Clown Posse and Color Me Badd?!?! BOOOOOOOSH!!! !